Hi everyone! Hope your week is going well. Tomorrow is the big drawing for the $75 gift card to CSN stores. Be sure to sign up if you haven't yet! Sooo, Ummm... guess there is a hurricane passing by Eastern NC later this week....thought when I left Florida, I wouldn't have to worry so much about that. Good thing I carry an umbrella in my handbag! 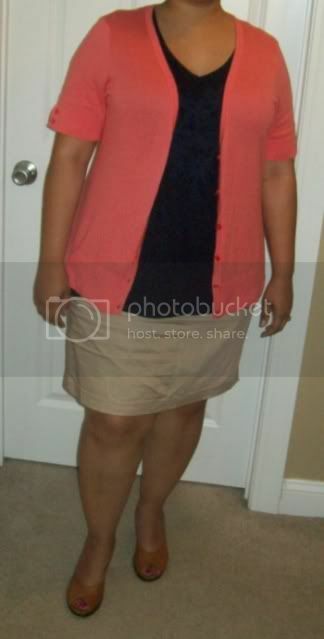 I felt like I have worn this outfit before, and I sorta did, with a different navy top, and a different khaki skirt LOL. Guess I like the color combo. Please excuse my wrinkles!! I love that patterned skirt! How cute. You take care...I heard about what's coming your way this weekend. Be safe and stay indoors! I love the pattern on that first skirt - really cute! I am so envious of your collection of patterned skirts. You did it again. Love the skirt. Going to Talbots tomorrow to see if they have any left in my size.